The Center for Career Development was thrilled to connect with Kimberly Ruiz, Neag School alumna and fourth-grade teacher at Dorothy C. Goodwin Elementary School in Mansfield, Conn.
What’s the Value of a Technical Education? 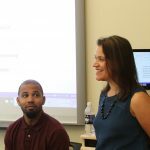 A faculty member as well as interim director for the Neag School’s Higher Education and Student Affairs (HESA) program, Milagros Castillo-Montoya has brought along her knowledge and passion for teaching and learning in classrooms with diverse college students. Current UConn student Reuben Pierre-Louis ’17 (ED), ’18 MA is set to begin his senior year in the Neag School’s five-year Integrated Bachelor’s/Master’s (IB/M) program with a concentration in special education. In addition, he will be serving as a resident assistant this coming academic year in UConn’s new ScHOLA²RS House Learning Community.